Put chopped nuts in the bottom of tube pan, well greased & floured. Mix ingredients well. Pour in pan. Bake on top shelf at 325 for 45-50 mine. Glaze: Melt butter, mix in wine & sugar. When cake is done, pour ½ of this glaze over it. Punch holes in cake. Let sit for about 20 min. Remove cake from pan. Pour balance of glaze over it. Cook cranberries, sugar and wine in a saucepan on medium heat until cranberries “pop”. This will take about 15 minutes. Continue to stir while they cook. After the cranberries have popped, add the jalapeno sauce. Stir in and then let cool. Cool completely in the refrigerator. To serve, place an 8 oz black of cream cheese on plate and add cranberry suace to top. Serve with crackers and bread. Option: good over warm brie also. Option: omit jalapeno sauce and serve over turkey, pork or chicken. This recipe comes from an Ardon Creek employee, Shellie Abraham, who works in our Tasting Room and does tastings at many farmers markets in the area. She is a great cook. Quite often we receive recipes where people have used Old Brick Red Blackberry wine when making a sweet dessert. We love this recipe as it is something different! Set meat out 30 minutes prior to cooking time to come to room temperature. Pre-heat cast iron skillet over medium high heat for 2 minutes, then add 2 tablespoons olive oil to skillet. Season beef with salt and add to pan searing for 4 minutes per side or to your desired temperature. Once you have seared and turn the meat season with pepper. This will keep your pepper from burning. After you have seared the second side remove meat to a plate and cover with foil to rest no less than 5 minutes. Reduce temperature to medium heat and add 1 additional tablespoon olive oil to skillet. Add onions and thyme and sauté several minutes. Add the wine and beef broth and bring to a simmer scrapping the bottom of the pan. Continue simmering until liquid coats the back of a spoon. Remove from heat and whisk in cold butter a little at a time to thicken sauce. Taste the sauce and adjust salt and pepper to taste add fresh blackberries and to warm through without cooking. Spoon over tenderloin and enjoy. Remember these are guidelines so make this your recipe. If you don’t like pieces of onion in your sauce then stain it before you serve it. If you prefer New York Strip steak to Tenderloin then use New York Strip steak. Just make sure you use Ardon Creek Old Brick Red Wine. Enjoy. 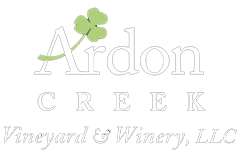 There are a lot of things that go well with Ardon Creek’s Stagecoach Red strawberry wine. It pairs well with light appetizers and salads. It also goes well with desserts – like chocolate! Here is a pretty straight-forward chocolate mousse recipe that we like to serve with it. * Beat eggs with an electric mixer on high about 3 minutes. Gradually beat in sugar. * Heat 1 cup whipping cream in a saucepan, over medium heat, just until hot. * Gradually stir about half of the hot cream into the egg mixture. Then add egg/cream mixture to the saucepan. Cook over low heat about 5 minutes, stirring constantly, until mixture thickens (do not boil). * Remove from heat and add chocolate. Stir until chocolate is melted. Cover and refrigerate about 2 hours, stirring occasionally. * When chocolate mixture has chilled, beat 1 1/2 cups whipping cream in a chilled bowl with an electric mixer. Beat on high until stiff. Fold chocolate mixture into whipping cream. Pipe or spoon mixture into cups. * Serve immediately or refrigerate until ready to serve. Top with crushed chocolate cookie crumbs, if desired. Makes 8 (moderate sized) servings. Recipe source: Betty Crocker’s New Cookbook (1996). A combination of the best of both worlds! We mix Ardon Creek’s dry red wine, Commission Man Red with dark chocolate to create a decadent dessert! 1. Preheat oven to 350 degrees. Line an 8×8 pan with foil extending the sides of the foil over the edges of the pan; spray with cooking spray and set aside. 2. In a large saucepan over low heat, melt together the butter and one cup of the dark chocolate chips, stirring occasionally to prevent scorching, until smooth. Remove the pan from heat and whisk in Commission Man Red. Let the mixture sit for a minute. 3. Whisk in the eggs to combine, followed by the sugar and vanilla. Lastly, add the cocoa powder, flour and pinch of salt. 4. Pour the mixture evenly into the prepared pan; sprinkle the top with the remaining dark chocolate chips. Bake for approximately 25-30 minutes or until the center appears set and a toothpick inserted near the center comes out mostly clean. Cool completely. 5. Cut into squares and serve. Can be topped with whipped cream, raspberries or vanilla ice cream and chocolate sauce. Or crumble brownies in small dish and top with fudge, raspberries and a little Commission Man Red wine. At Ardon Creek, we think our new Sweet Reward Raspberry Chocolate wine goes absolutely great with cheesecake! We know there are many great cheesecake recipes out there – but we particularly like this one from Martha Stewart. It makes a big, rich cheesecake that serves a good size group – like the one we have regularly to bottle wine or prune grapes. They were especially pleased to receive this treat after bottling Sweet Reward one day. 1. Preheat the oven to 350 degrees. Butter the sides of a 10-inch springform pan. Wrap exterior of pan (including base) in a double layer of foil. 2. To make the crust, process graham crackers in food processor until fine. Combine graham cracker crumbs, butter, sugar, and salt in a medium bowl. Transfer mixture to the pan and pat into an even layer using the bottom of a measuring cup or meat pounder. Freeze the dough in the pan, about 15 minutes. Place pan on baking sheet. Bake until the crust is firm to the touch and deeply golden brown, about 15 minutes. Transfer pan to a wire rack to cool completely. 3. In the bowl of an electric mixer fitted with the paddle attachment, beat the cream cheese on medium speed until fluffy, about 3 minutes, scraping down sides as needed. 4. In a large bowl, whisk together sugar and flour. With mixer on low speed, gradually add sugar mixture to cream cheese; mix until smooth. Add sour cream and vanilla; mix until smooth. Add eggs, one at a time, beating until just combined; do not over mix. 5. Pour cream cheese filling into prepared pan. Set pan inside a large, shallow roasting pan. Carefully ladle boiling water into roasting pan to reach halfway up sides of springform pan. 6. Bake 45 minutes; reduce oven temperature to 325 degrees. Continue baking until cake is set but still slightly wobbly in the center, about 30 minutes more. Turn off oven; leave cake in oven with the door slightly ajar, about 1 hour. Transfer pan to wire rack; let cake cool completely. Refrigerate, uncovered, at least 6 hours or overnight. Before unmolding, run a knife around the edge of the cake. In a large pitcher, combine the pineapple juice, lemon juice and orange and lemon slices; mash gently with a wooden spoon until the fruit is partially crushed. Add the wine, apple slices and triple sec. Regrigerate 2-4 hours. Just before serving, add soda. Serve over ice or serve over ice cubes made from white wine to avoid diluting the Sangria. Please let us know if you have any new and exciting recipes using Ardon Creek wine.